What I like: Easy to get into, enough factors to make combat interesting, challenging. Not So Much: Dated visuals, click-heavy controls, can’t specify attack path, a little slow, limited resolution choices. Other stuff you may like: Multiplayer offered, included historical background. Many review sites only give you the games hot off the press. Not me, here you also get the old stuff! Tin Soldiers: Julius Caesar was released in 2005. Does it hold up to more modern games like Risen 2 and Gettysburg: Armored Warfare? Hey no fair, you looked at the score before you read this. 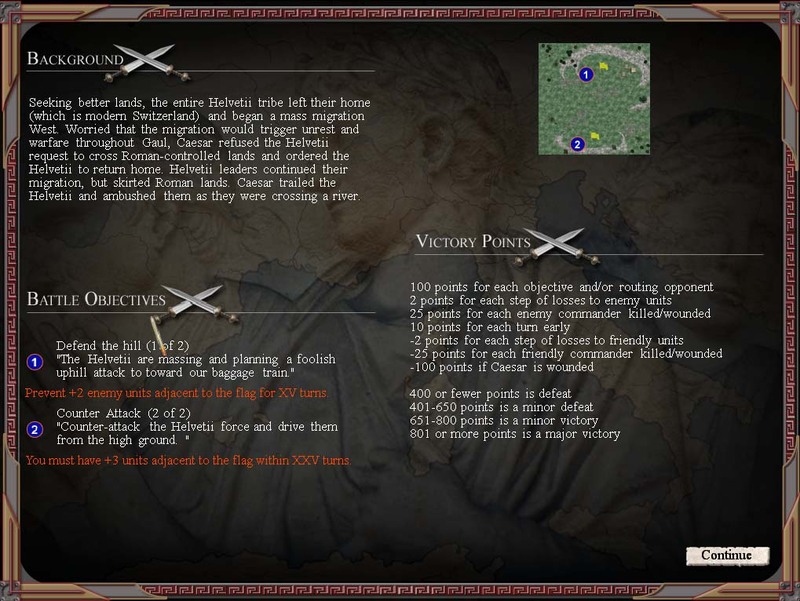 Tin Soldiers is an enjoyable turn-based tactical wargame depicting the historic battles of Julius Caesar. It uses a initiative system to carry out unit orders. This game has an older sibling based on the exploits of Alexander the Great, but I don’t have any experience with that one. Tin Soldiers was recommended to me on the Wargamer forums several months ago as a quality tactical wargame, which is why I dusted off the time travel machine to get a copy (I could have just headed to the Matrix Games site). The game can be played head to head over an IP connection, but as a single-player gamer I can’t vouch for it. I recommend reading the manual, at least pages 13-22, even though the gameplay is pretty straight forward. It does a good job of explaining the mechanics (except for the effects of the Charge and Counter-Charge commands). There is no in game tutorial and the forum hasn’t had a post in over a year (except for my one unanswered question), so it is a good thing the manual does the job. There are two avenues for playing the game, the campaign and set battles. The campaign wraps the scenarios into a loose structure where money is used to replenish troops and buy action cards. One of three difficulty levels must be selected at the start of the campaign and can’t be changed, so select one and hope for the best. Being a pretty normal guy, I selected normal. The Gallic campaign is the first set of 6 scenarios and represents Caesar’s conquest of Gaul. The scenarios can be played in any order, and the campaign wrapper is simple. There are 5 levels of prestige. Winning a regular victory increases prestige by one level, a major victory by two levels, and a loss has no effect. Once you increase the prestige beyond the last level, you must quell an uprising by winning the Battle of Alesia. 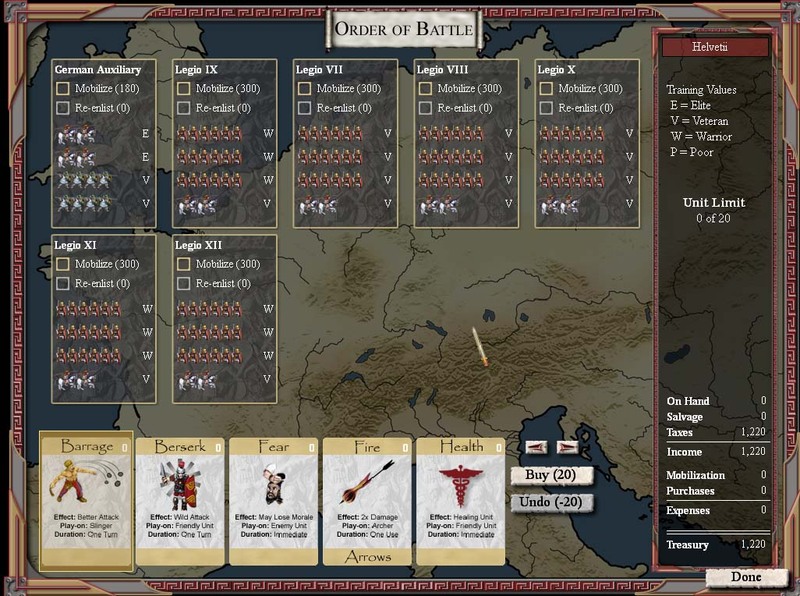 This is followed by the Roman Civil War containing a new set of 7 scenarios. Don’t despair if you lose a scenario as a major victory in another one can make up for it, or you can choose to immediately replay the one you lost. Any of the campaign scenarios can be played as a set battle. Your units are already placed on the map, waiting for their first command. If the campaign proves too difficult, you can always play the battle on its own without missing any content. The set battle defines what action cards are available, so the player does lose the ability to customize his hand. 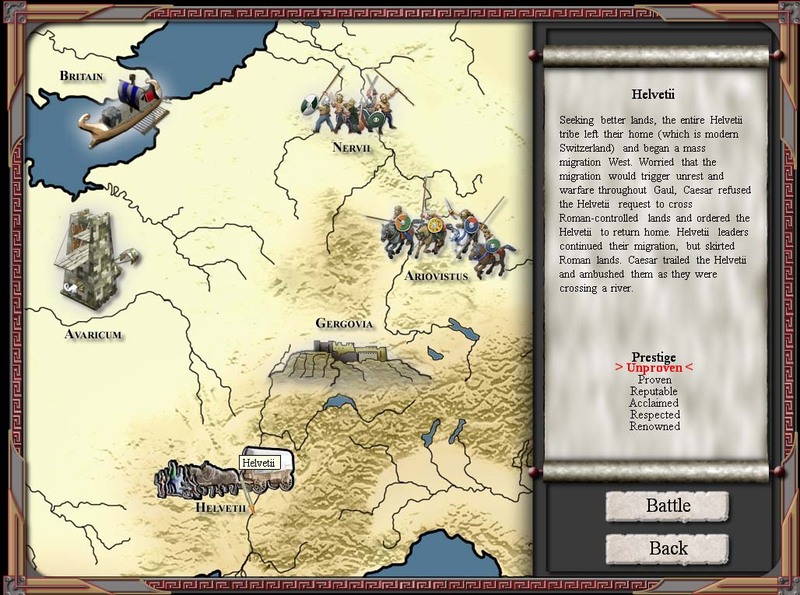 The campaign screen displays the scenario choices, along with your current prestige level. The scenario description gives some historical context for the battle you are about to begin. The presentation of Tin Soldiers is based on tabletop wargaming, with men on stands that slide around the terrain. A unit is typically comprised of 2-6 stands that act as a group. Below are 3 units, each comprised of 6 stands. Each stand has 5 steps of strength and loses one step each time it is hit in combat. Once 5 steps are lost, one stand is removed from the unit. This is important, because each stand is worth a number of chances to hit in combat. The unit loses combat power as stands are removed. Each unit is lead by a historical leader, which may provide 1 or more of 4 tangible benefits or penalties. If the leader is killed in battle they are permanently lost. The Order of Battle is the first step of each scenario in the campaign. Use the funds in the treasury to mobilize your legions for the selected scenario. In the first scenario, they are all at full strength and are trained to various levels. As they take casualties, and they will, the player has 3 options; pay the re-enlist cost to return the legion to full health, rest the legion by sitting them out of the current scenario to recover 50% of their losses at no treasury cost, or send them to battle at less than full strength. In either of the first 2 cases, they will lose a level of training for every 2 stands that are regained. I tended to replace their losses, but I’m not sure that was always the best choice as an experienced unit performs more effectively in combat. The choice is yours General. Units that survive in battle gain one level of training. Scenarios may also offer auxiliary units, which do not carry over to the next scenario. Hmm, if someone has to be sacrificed I wonder who it will be? Action cards can be purchased in the campaign game before each scenario. These offer some useful benefits and are a fun way to introduce some strategic choices during the battle. The cards can improve the combat ability of a unit, affect the unit’s morale, restore lost health, improve initiative, scout an area of the map, and improve a unit’s defense. I found many of them to be well-worth their cost. I don’t fully understand the treasury mechanic and how the game determines how much money is added after each scenario. I used the funds I had and didn’t think about it too much. It would have been nice to get a clear explanation from the manual, but the lack of clarity didn’t affect my enjoyment of the game. Each scenario has victory point thresholds for defeat, minor defeat, minor victory, and major victory. Victory points can be earned and lost in a variety of ways - due to casualties in combat, killing leaders, and meeting objectives (with bonus points for early completion). Typically objectives are either to hold area(s) for a number of turns or capture area(s) within a number of turns. Areas are controlled by having ‘x’ more of your units surrounding the flag then the enemy does. Some scenarios have a mixture of these objectives, such as hold location 1 for 10 turns and then capture location 2 within 20 turns. You can still be victorious without meeting all objectives if your combat performance is strong. When fighting in the campaign the player has the opportunity to deploy his troops within specified locations. Some locations are limited to a particular unit type. The set battles already have the units deployed. There isn’t a lot of variety in deployment locations, so it didn’t add a lot to the game. Keeping units in the same legion together does provide a morale benefit. Other considerations are where you put your stronger units - support the middle, support weaker units, etc. The combat model is pretty basic, but has enough factors to keep it interesting. Each unit has 6 basic attributes that determine how it performs in battle. There are four levels of training, armor, and morale. The unit’s weapon, number of stands, and any leader attributes further determine a unit’s ability to fight. Unit morale and training provide simple +/- to a unit’s attack, as does the opponent’s armor. The leader attributes can provide +/- to attacks in addition to affecting morale checks and reacting to battlefield events. The number of stands in a unit determines the number of chances the unit has to score a hit in combat. Finally the weapon comes into play. Spears are better for charging and defending cavalry attacks, swords have the advantage when attacking spears, and ranged units can rain death from afar. Don’t forget, your cavalry does not like attacking war elephants and may refuse to do so! Terrain also comes into play, but its role is very simple. Melee units receive a penalty when attacking an enemy on higher ground or behind a wall. Yes, there are scenarios where you must either assault or defend a walled structure. Passing over a wall also uses up the units entire action for a turn. Ranged attacks gain an additional benefit when they are attacking from higher ground. Maneuvering units to flank the enemy provides benefits to the attack. Be careful, because the AI is pretty adapt at flanking your units. The manual has a handy appendix that displays the effects of the various combat modifiers. Tin Soldiers has an enjoyable combat engine with enough to chew on to make the player feel like they are commanding a battle, but easy enough to jump in and understand what is going on. Each turn is made up of 3 phases: command, reaction, and reserve. The first is the command phase in which both sides issue their orders. Each unit on both sides is assigned an initiative number, which controls the sequence units carry out their orders. Typically cavalry goes first. Press the play button to execute the first 5 minutes of the order. The reaction phase may give each side the opportunity to issue new orders if certain events occur, such as blocked movement or the attacker’s target moved away. Press play again to execute the next 5 minutes of the battle. One of the orders that can be assigned to a unit is the reserve order. This holds the unit in reserve until the last phase, where they can be issued an order. This lets the general hold back some units to respond to the enemy’s actions. Finally, the last 5 minutes of the battle are played out. This is a great system. I enjoy simultaneous systems as they do a better job of modeling the uncertainty of battle. There is more tension when you are unsure which unit will attack first. Will the enemy unit still be there when your unit gets to attack? The reaction and reserve phases add some welcome fluidity to the action. You Will Obey My Command! No, I’m not talking to my son. There are 9 orders to issue to your units – move, melee and ranged attack, charge, retreat, change facing, defend, counter charge and reserve. Unit facing is key as your units can only move and attack in the general direction they are facing (front left, front, and front right). 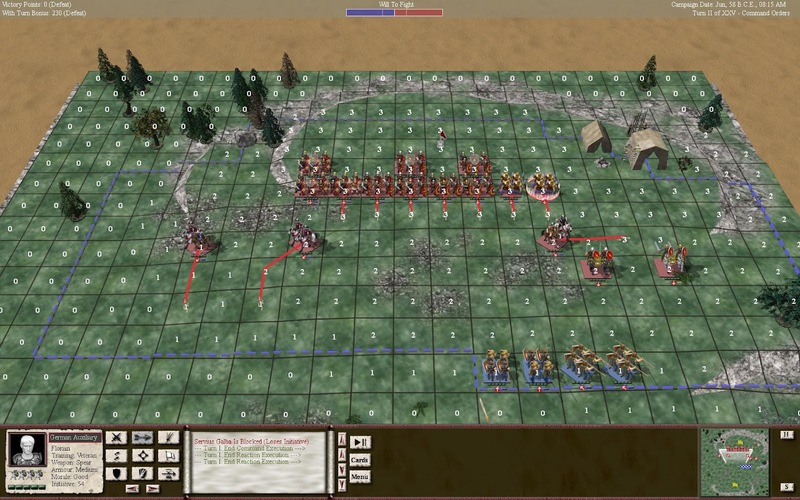 Having your units positioned and facing in the desired direction is probably the most challenging aspect to the game. If they aren’t facing where you want, the change facing order is available to set the facing to any direction. It is best to use this sparingly as it uses up the entire turn’s actions for that unit. I am unsure of the exact affects of charge and counter charge. There are some attack modifiers for charging units, but I couldn’t find any information for counter charge. The defend order gives a small combat penalty to the attacker if they attack a defending unit. This works well with the initiative system as you don’t know which units will be defending when you unit attacks. Retreat orders the unit to move directly in reverse and then change unit facing 180 degrees. As mentioned earlier the reserve order withholds unit action until the reserve phase. Ranged attacks can be quite useful and well-protected ranged units can cause quite a bit of damage. Roman infantry carry a pilum, which allows a single ranged attack per battle. One quirk with the movement and attack orders is that while the target can be specified, the path to get there can’t. Sometimes this can lead to units impeding each other when it could have been avoided by specifying waypoints. It isn’t a huge deal, but it can be annoying. I’ve already touched upon many of the combat basics, but there are some more interesting details. A unit that takes more damage than the opponent may get pushed back one square. If they get pushed back through an enemy unit, extra damage is inflicted. If they get pushed back through a friendly unit they lose extra morale and may cause the friendly unit to lose morale too. This adds some extra strategy since it is beneficial to push back the enemy units while making sure your units are not pushed back into friendlies. A unit that pushes back another even gets a reaction order in the reaction phase. - One check per combat step of damage a unit takes. - One check for each stand removed from a unit. - A unit pushed back through a friendly unit will always lose a level of morale. - One check per nearby friendly unit eliminated or routed in battle. - One check if a unit's leader is killed or wounded in action. - One check if any nearby friendly heroic leader is killed in action. - Lose one level of morale if any friendly routed unit is pushed back through it. - A cavalry unit must check morale if ordered to attack or charge an elephant unit. Reduced morale reduces combat effectiveness. After each turn a unit has a chance to recover lost morale. Once a unit is routed they continue to retreat until they recover one step of morale. A routed unit can’t be issued any orders. A Roman Legion unit adjacent to any other unit in his Legion receives a small bonus to morale rolls. A combat log displays the various combat modifiers in effect per attack, and the results of an attack. The problem is that it is difficult to match the results with the units, unless you can memorize the names of all the leaders. It would have been helpful if the player could click on a log entry to highlight the units involved. The action can be paused to view the log as combat occurs, but that makes each turn a bit tedious. Combat already is a little slow in that the camera jumps around from unit to unit in the sequence orders are carried out. The camera could move a little faster. One other minor issue is that I couldn’t find any information as to the base chance a unit has to successfully attack another. You start to get a feel for combat after playing, but it would be nice to know your chances. Most information is available at your fingertips while in the midst of a battle. The player can rotate, pan and zoom the battle area. This works pretty smoothly during the battle, but panning was a little jumpy with the mouse during unit deployment. Using the keyboard during unit deployment solved the problem. To issue an order, select the unit, click on the order button, and then click on the target if necessary. This results in quite a few clicks, but is simple to use and not prone for errors. Hotkeys are available for the order buttons for those who prefer them. Facing is depicted by the small arrow in the red circle at the bottom of the unit and is one of the most important items to keep track of. The morale and training level are displayed to the left and right of the facing icon. Above that are circles representing the number of remaining steps for the unit taking damage (all damage is applied to the right most stand in the unit window). The unit’s weapon can be identified on the units themselves. In addition there is an info panel in the bottom left corner of the screen that displays all relevant information for the selected unit. Terrain height is important, but it clutters the display quite a bit (the white numbers in the squares). I had a hard time noticing changes in the terrain without the numbers turned on. In some scenarios I could keep the terrain height indicators off, but I kept them on for the most part. The red lines depict your unit’s movement and attack orders. Other orders display an icon above your unit, such as the shield for the defend order. The blue lines show your unit’s line of sight. This can be turned off, but what enemy lies beyond your line of sight is always a mystery (unless a scout card is played). While issuing the attack order the combat modifiers are displayed as a tooltip so a bad plan can be halted before it starts. The game also reminds the player that some units haven’t been given an order, which helped me several times. There are a couple items missing that would have been helpful. A visual representation of a unit’s maximum range for a ranged attack would have been welcome, along with the area of effect when playing the scout card. As a whole, the UI does the job of keeping the player informed while letting the player easily command his units and survey the battlefield. As mentioned earlier, there are 3 levels of difficulty, but I have no idea what it affects. I stuck with normal. The AI provides a good challenge and will take advantage of stray units, maneuver to flank, and generally make good decisions. The one weakness I saw was that the AI will sometimes return a formerly routed unit back to combat on its own which may leave it vulnerable. Part of the challenge is that the player usually / always seems to be outnumbered. Sometimes our units must be spread a little thin. Our infantry units tend to be a bit stronger by having more stands than the enemy, providing us with more chances to hit. Patience is rewarded. During my first scenario, I moved ahead too quickly and lost. The second time I paid more attention to terrain levels and tried to take advantage of match ups better and won. After my first loss I ended up getting 5 minor victories and 2 major ones in my next 7 scenarios. The available resolutions range from 1024x768 up to 1680x1050. It may be less than optimal if your monitor’s native resolution isn’t available. My LCD monitor’s native resolution is 1920x1080. In my ATI Catalyst Control Center I used the settings to display the image centered on my monitor, instead of stretching it. The game used most of my monitor and the image quality wasn’t degraded due to scaling, so in the end it wasn’t a big deal for me. Hopefully you can see from the prior screenshots that the graphics are serviceable, but they probably weren’t cutting edge when the game was released in 2005. The units could be a little sharper and the terrain more detailed, but didn’t interfere with my enjoyment of the game. I found the sound unremarkable as I can’t even remember what the sound effects or music sounds like. I didn’t turn them off, so they couldn’t have been too bad. The installation required version 1.1 of the .NET Framework. A warning message displayed that there is an incompatibility issue between this version of .NET and IIS (internet information services) on my platform (64 bit Windows 7). I’m not using IIS (used for publishing websites and related services), so I continued with the installation. I haven’t noticed any problems. It may only be an issue if you are developing software using the 1.1 version of the .NET Framework and deploy that software to a 64-bit Windows 7 system. For some reason I couldn’t download the 1.11 patch from the Matrix website. I’m not sure if it was a temporary glitch or a more permanent issue. I downloaded it from FileFront without issue. Other than a couple crashes while loading a saved game file, the game performed flawlessly without any crashes or hiccups. I never lost any saved games or had my progress hampered. The crash only occurred when loading a saved game on my first turn before doing anything else. Did I find my trip back in time fruitful? I would say yes. The mechanics were interesting and made sense. The gameplay was challenging and suspenseful as I sometimes didn't know I was going to win until close to the end. The use of the simultaneous order resolution provides a more authentic feeling experience then a strictly turn-based one. I know because I was a former general in 45BC. The game provided a nice mix of offensive and defensive objectives. Defending and assaulting a walled structure provided more of a diversified challenge than having all battles occur in the open field. I loved having powerful ranged units on my towers to rain down death (until of course the enemy breached my defenses and crushed them). A more sophisticated use of terrain would have been interesting, but perhaps that wasn’t applicable to warfare during this period (I have no idea). Tin Soldiers is a tough game to sit down and play for a marathon session. Each scenario typically took over an hour and they were challenging. Waiting for the camera to follow the active unit is sometimes tedious. I played through the set of Gaul scenarios, including the final conflict in the Battle of Alesia. I still must persevere through the Roman Civil War scenarios. I know there are some mighty war elephants to be encountered. If there is anything worth noting in the latter part of the campaign, I will either update this review or have a part 2. From what I saw it looked like there were not any game changers in the remaining scenarios. Perhaps if we showed some love for Tin Soldiers back in 2005, Koios Works would still be with us today. Even 7 years later it is a worthwhile game if you enjoy tactical warfare. I liked this game, it wasnt hard to play, didnt have too many units, and it was "cute". IMO it was a very good representation of miniature ancients gaming. But replay value is limited. Where this game failed was that theres no map or battle editor. The battles are hard coded into the executable so theres no hope of being able to "hack together" a battle of your own. Good observation. Sometimes I lose sight of that because I tend not to replay scenarios much and am always looking for something new (or as the review shows just new to me!). While modding existed in 2005, I think it has really exploded in the past several years, to the point that games are designed to be moddable now. This was and still is a good game. The sort of game, like Battlefield Academy, that I would call a 'Christmas Game'. Fun, fairly easy to get into and something you can play quickly after a few pints on Christmas day or Boxing day. I think I was put off by the last version as you had to repeat each level until you were victorious which could get a bit tedious - sure there is a cheat for this though. Thanks for the review and bringing back fond memories! I agree with your comparison to Battle Academy. They are both easy to get into, but have enough detail in the combat model to be interesting. At least the scenarios are available to play stand alone so if someone gets really stuck they can play them that way. Of course that may not be quite as satisfying as completing the campaign.